Even on a Cruise Ship, at Sea, Schedules are Made To Be Broken and Geopolitics Hold Sway. I already knew that in one out of every four HA cruises around the southern tip of South America, a landing at the Falklands is not possible. This is not surprising. The Falklands experience some of the worst weather on the planet. Despite its dismal reputation, the climate during the austral summer (Dec-Feb) can be moderate, with temperatures occasionally reaching 75° F. But we are now in the southern autumn. The total land mass of the islands is roughly equivalent to the state of Connecticut. The capital is Port Stanley, located on the Eastern Falkland Island, where two-thirds of the population of 2,500 live. Nearly everyone else who lives in “the camp,” the term for the countryside, is involved in sheep ranching. I’m reading “River of Desire,” by Simon Worrall, on my Kindle. In Patagonia, Worrall says, people begin counting the speed of the wind from 50 kilometers (about 30 knots) an hour. That’s zero! A “concerning” wind is about 200. To prepare for cold, windy on-shore experiences, Günter and I have packed a duffel with our sailing jackets, fleeces, long silk underwear, gloves and caps. On Thursday, March 22, Veendam Captain Frank van der Hoeven announces that our ship may or may not land in the Falklands, depending on whether he is able to anchor there: “We are experiencing Force 7 winds, a light SW gale, at 33 knots. If the winds there come from the right direction, we might be sheltered from the long fetch by the land mass of South America. Then we can board using tenders.” Later that day, the Captain orders the stabilizers to be put out. These are 18’ long and 8’ wide. He has to reduce speed to use them, so we will be late in arriving. On Friday, March 23, at 0805, the captain announces that he is regrettably canceling the stop and proceeding for two days directly to round Cape Horn. Several boats already there are “wallowing in the wind,” he says. They report Force 9 winds, 50+ knots from the SW—not promising. Outside our veranda window, we can see racing whitecaps and spindrift. We do not even want to open our sliding glass door to the balcony! The whining of the wind is constant—sometimes a high whistle, sometimes groaning with the gusts. Surprisingly, with the stabilizers out, the ride on this cruise ship is not too rough. Günter and I can only imagine what it would have been like in our 43’ yacht! By noon, there is another Captain’s Announcement: The wind is down to Force 8, with swells lessening to 16’. He expects that we will round Cape Horn by 6 p.m. on Saturday. He has altered course directly to the Horn waypoint, proceeding more slowly to ensure our comfort. “Here the warm Brazilian current meets the cold 2.5-knot Falklands current,” he adds, “causing rough seas.” He expects the winds to lessen as we reach the Cape. 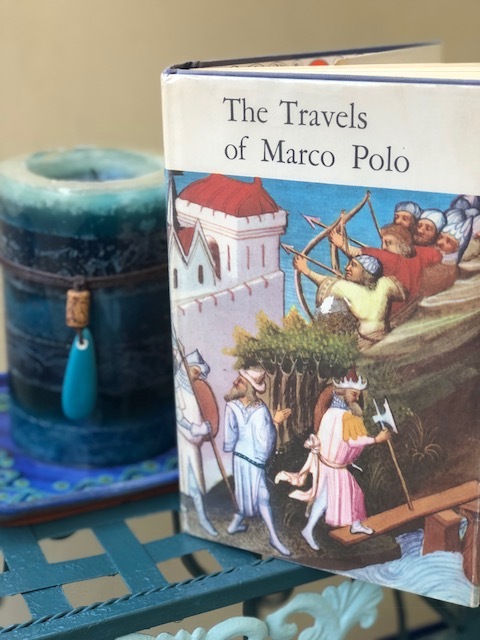 Sailing around the world on our own yacht, we have learned to accept the winds and currents and to “go with the flow.” The political situation in the Falklands, though, has piqued our interest and we continue to follow the news. While in Buenos Aires, the English translation of the local newspapers contained daily headlines about a new conflict between the Brits, who own the Falklands, and the Argentineans, who have been taught in their schools that these desolate islands are rightfully theirs. The headlines scream, “Malvinas Stand-Off.” Some articles report that by reasserting its claim to the islands, the current government led by liberal President Christina Fernandez Kirchner is gaining the popularity it had lost. It’s amazing how little we hear about worldwide events in the U.S. I had not heard about any conflict in the Falklands since the struggle for control ended in 1982. This ratcheting up of tensions is the run-up to the 30th anniversary of that war on April 2, 2012. Some history here: It was the French navigators who gave the islands their Spanish name, Isla Malvinas. Beginning in the mid-1700s, the Falklands have been the source of many battles between countries fighting for control. The islands themselves were strategically important for those ships rounding The Cape before the Canal was built, but they continued to languish economically until the wool business became lucrative. Thirty years ago, Argentina seized the Falklands and the U.K. invaded to get them back. Britain claimed that the islanders had a right to self-determination; the British population wanted to remain British, of course. The Argentineans were no match for British troops, although both sides suffered serious losses: 255 U.K. servicemen were killed; 649 Argentineans died in the conflict. Although there is a lot of talk about Argentinean pride and the islanders” right to self-determination, it is the discovery of oil that has caused current tensions. Three oil companies want to drill in these tempestuous seas, especially because oil is being depleted in the North Sea. While we were in Buenos Aires, it was reported that a cruise ship that had already stopped in the Falklands was denied entry into Buenos Aires or any Argentinean ports. That problem does not pertain to our ship because we are going the opposite way. The Argentineans are also upset with Peru for conducting standard military exercises with a British ship. Later during our voyage, the Veendam is two hours late leaving Ushuaia, Argentina because it has been held up by the port captain. Reportedly, our captain was asked to sign a statement saying that the Veendam would never again include the Falklands on her itinerary. He did not have the authority to sign, and had to wait for an answer from the head office. Of course, the corporation would not consent to the request, but the ship agreed to pay a “port fee” to be able to sail away. Captain Frank apologized again and again that, because of the delay, we would miss viewing much of the fjords and would not reach the world-renowned Ushuaia glaciers before sunset. I could hear the controlled anger in his voice. On our own yacht, we often repeated the phrase, “Pacific Bliss is not a train, not a plane, and not a cruise ship,” in answer to questions and complaints about schedules. But now, we realize that even a cruise ship can miss scheduled stops because of wind, weather, and geopolitics. 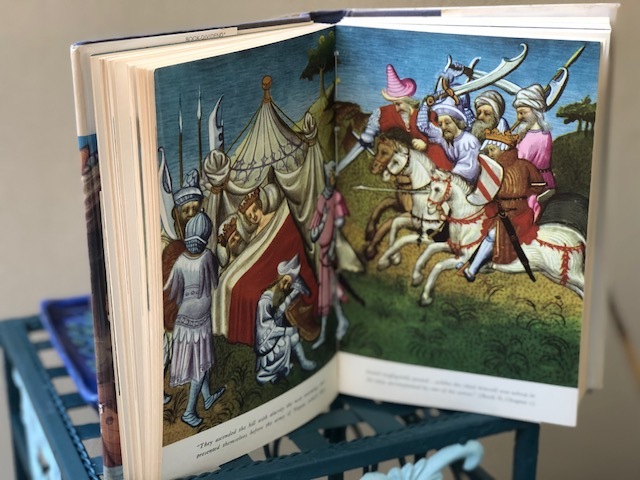 The bad news about touring a country half-way around the world is, of course, the long flight: 5 hours across part of the U.S., a 4-hour layover in Chicago, followed by 14 hours to Delhi, the capital of India. A rambunctious two-year-old in the seat behind me keeps kicking the back of my seat, so even with a sleeping pill, I cannot sleep until he tires out. The good news is that the 12-hour time difference between San Diego and Delhi allows Günter and me to arrive early in the evening, stay up for a few hours, and then fall into the deep sleep of exhaustion for the entire night. We are clearly in a time warp; it seems strange to have “breakfast” on the plane prior to landing, and then to be driven through the city streets in twilight that appears to us as dawn’s first light! We are not hungry for dinner, so we head down from our room at The Claridges Hotel to its Aura Vodka Bar for a drink. The ultra-modern, humongous bar has 47 stools, 50 varieties of vodka, and dimmed-and-dancing, diffused green lights that slowly shift from green to blue and purple. The bar’s space-age ambience adds to my sense of disorientation. Who knows? I could have been beamed up to this surreal starship! Günter and I slump into a cozy corner settee that faces a flat-panel TV set to the Fashion Channel. I am more intrigued by the group of businessmen at the table in the opposite corner. While I pretend to watch a Milan fashion show, I eavesdrop on their conversation. The group includes a short-sleeved American who brags about Great Lakes steamers, another casually-dressed businessman with an Australian accent, a European who is probably a Swiss banker, and two Indians with white, long-sleeved shirts and conservative ties, obviously the hosts. Potash is hot, I learn. Over their first vodka, the men hurl the familiar business lingo: strategy, phasing, roll-out, and partnering, playing up what a “good marriage” it can be. By the end of their second round of drinks, names of commodity companies, such as Rio Tinto, come out of those loosened lips, but not enough for me to put it all together. While Günter drinks his beer, I sip on my raspberry-infused vodka cocktail that also contains cranberry, lime juice and sugar—an innocent drink that I’m certain will take its toll later. The breakfast buffet here at The Claridges is average—not like the blow-out buffets we enjoyed a few years ago in Southeast Asia and China. The spread is an easy introduction to Indian food, along with European alternatives. Little do we realize that we should appreciate the blandness, because the spreads will not stay this way throughout our three-week adventure! Ah! What I love about travel is that is pushes you out of your comfort zone. Travel forces you to listen to new ideas, to look at other ways of living on this planet. 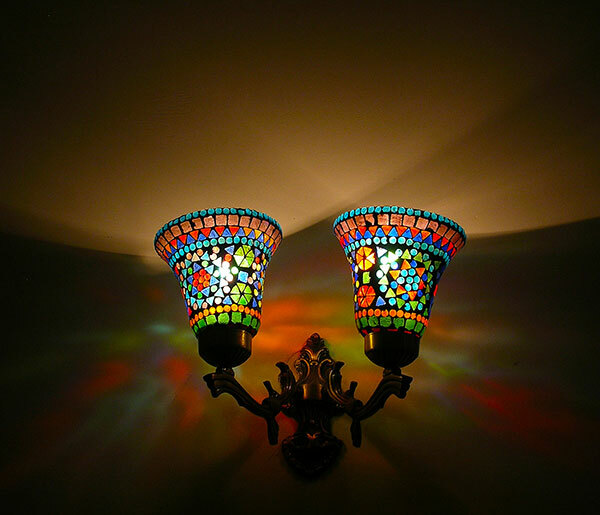 Even before we go out to sight-see, strange and different TV programs and newspapers pry open our pores so that we can absorb new insights and understand a culture vastly different from ours. The daily drone of schedules and TO DO lists are far away—out of sight and out of mind. At 1100, our Enchanting-India trip coordinator, Bhawna Sharma, promptly appears in the lobby as scheduled. The Enchanting-Travel group of companies specializes in tailor-made travel experiences using local guides—just what we want. “By perfecting your arrangements from our first interaction until your flight home, you’ll see India through your own lens and digest all the sights and sounds that make India, India,” says the brochure. 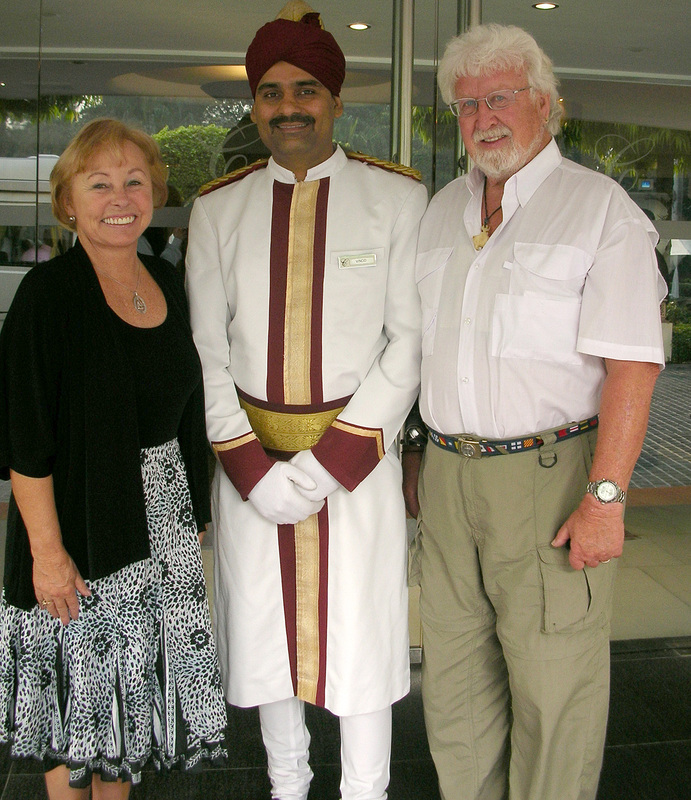 Bhawna assures us that she will be the master coordinator of our guides and drivers at each of our six destinations. 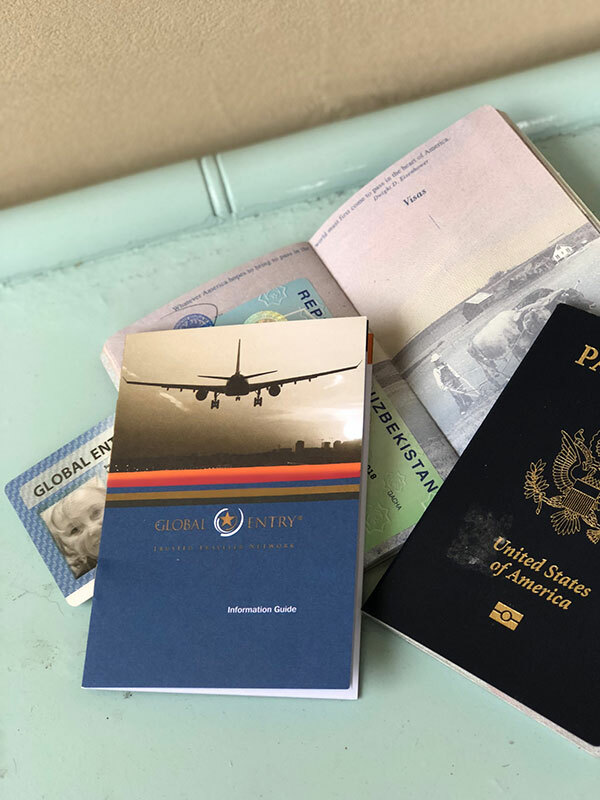 She hands us each a small 4×5” personalized booklet that contains a summary of our itinerary along with a two-page overview of our hotel and proposed activities at each stop. 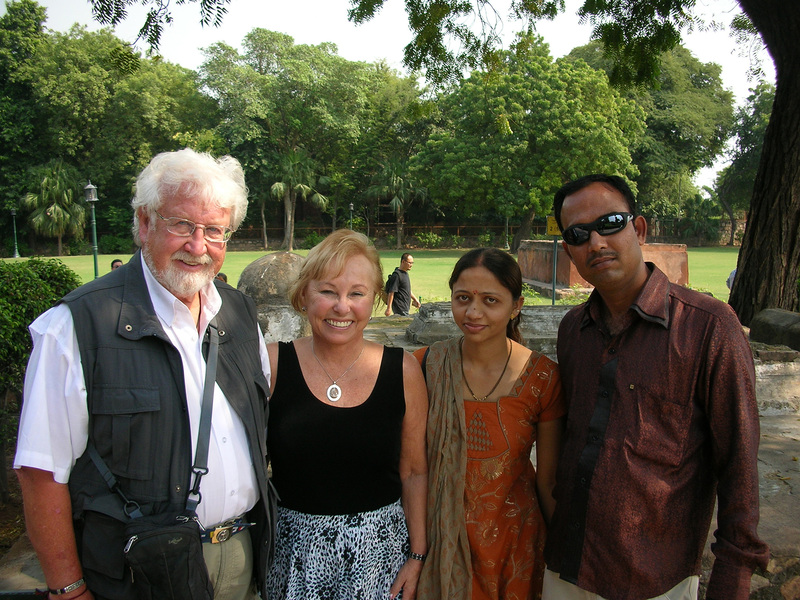 Then she introduces our driver and guide for the two days we will tour Delhi. Our first task is to get a new SIM card for Günter’s old cell phone, so that he can eliminate roaming charges on his Smart Phone. We drive through New Delhi traffic for hours, or so it seems. To get a SIM card here requires a copy of his passport (which fortunately he has), and a passport photo (which he doesn’t have). We stop in a small off–the-highway shop with concrete floors and slapped-together, unpainted wooden shelves. Here? All of this technology will magically happen here? Apparently so. The proprietress wears a purple print sari and her shiny black hair pulled back into a bun. She digs behind the counter to locate a small point-and-shoot camera. She snaps the photo, prints it out, and attaches it to a form that she asks Günter to fill out. Mission accomplished! Our skilled driver winds through snarled traffic and impossible roundabouts that put Boston to shame. 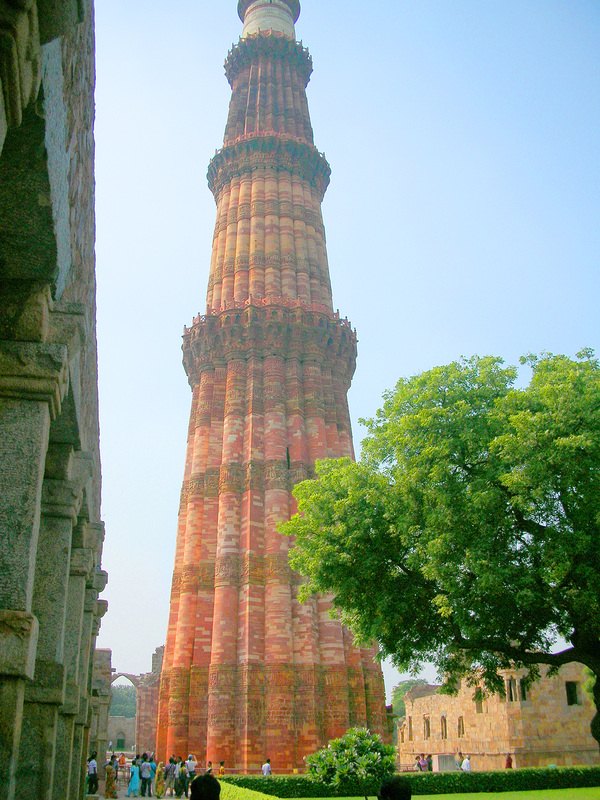 Finally, we reach our first sightseeing destination: the Qutab Minar, a structure that dominates Delhi. The largest free-standing tower in the world, it surpasses the Leaning Tower of Pisa. This UNESCO World Heritage Site also has the distinction of being the tallest brick minaret in the world, at 238 feet (72m). 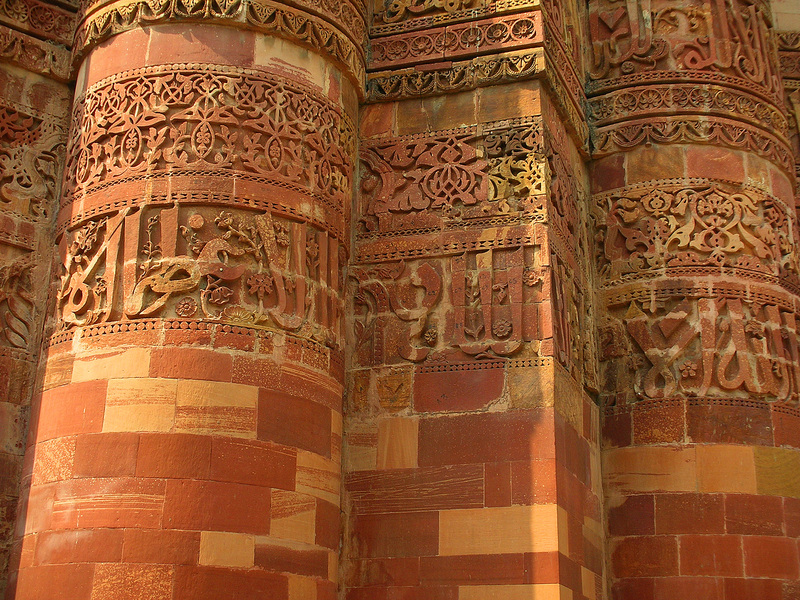 Made from bricks of red sandstone, the entire Qutab Minar is covered in various inscriptions from the Qur’an. Although the minaret was previously open to the public, it is now closed off. In the 1980s, a number of people were killed when an electrical failure within the minaret sparked a stampede. There are 378 steps leading to the top of the Qutab Minar, and before its closing it was a very popular site, and not only for tourists, but for those wanted to commit suicide by jumping. Our next stop was to be the Raj Ghat, a memorial to Mahatma Gandhi. We discover that the site is basically a black marble platform that marks the spot of Mahatma Gandhi’s cremation, left open to the sky while a flame burns at one end; we decide that getting there is not worth fighting traffic and jet-lag in the heat of the day. This is the advantage of independent travel! The plan is ours to make or break. We return to our room. Günter turns up the air conditioner. We slide under the cool, white sheets, soon dead to the world. Later, we head for the pool, and after an invigorating swim, we fall asleep again in our poolside chairs. The next morning, we are seated at the Pickwick Restaurant as soon as they open at 0630. The sun rises like a faded yellow ball through the haze outside our window table. This haze does not lift until noon. Whatever. It does not make for clear photos! Our first stop this day is the Jama Masjid, also called The Friday mosque. Towering over Old Delhi, the structure can hold a mind-blowing 25,000 worshipers. We are there well before the 1100 Friday prayers, in time to watch the men laying out hundreds of carpets, each one in the same neutrals of brick red and gold that blend with the colors used in the mosque. We walk the entire length of the huge plaza. This is India’s largest mosque, Shah Jahan’s final architectural opus, built from 1644-1658. It has three gates, four towers, and two minarets, each 40 meters high—all in red sandstone and white marble. Inside, the mosque is mostly bare. The speaker’s seat is simple, covered with smaller rugs—not artistically arranged. Our second stop is the Red Fort, a massive empty shell of a place. The numerous moats and fountains are not filled. The greens are kept mowed and the many sidewalks are clean, but this attraction could be made into a great park rather than merely collecting fees as a museum. Imagine the former splendor of this Mughal city—it was a time of unparalled pomp, proud eunuchs, ceremonial elephants, and grandiose buildings lined with precious stones! Imagine how the drawbridges creaked as they were lowered over the moats! This fort was to be part of the new capital of Shahjahanabad. Shah Johan never moved here from Agra because he was imprisoned by his own son, who was the last emperor to rule here. Following the 1857 War of Independence (Indian uprising) the Brits cleared all but the best buildings to make way for barracks and army offices. So the moat has been dry since 1857 and the drawbridges have been replaced with bridges of stone. Every Independence Day, the prime minister addresses all of India from here. We find the site filled with Indian soldiers, especially at Lahore Gate, a structure that faces the city of Lahore, now part of Pakistan. 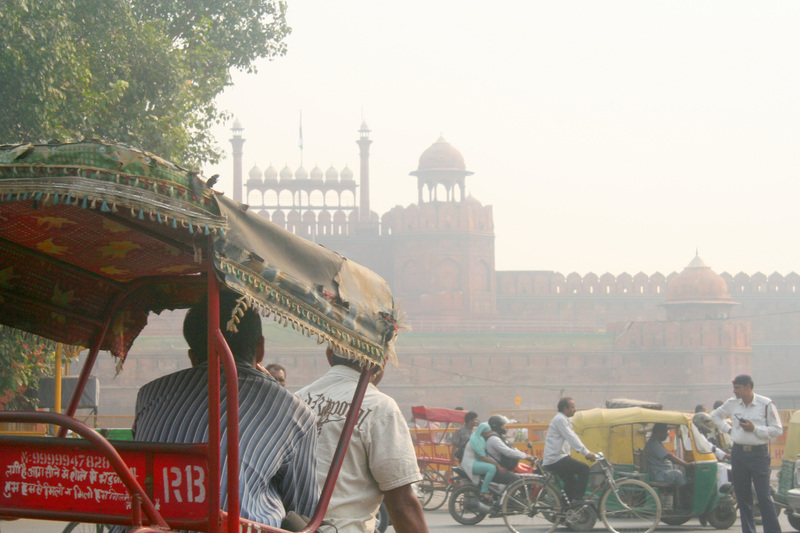 Next, our guide puts us on a rickshaw at the east end of the Chandini Chowk, the spine of Old Delhi, near the Red Fort. 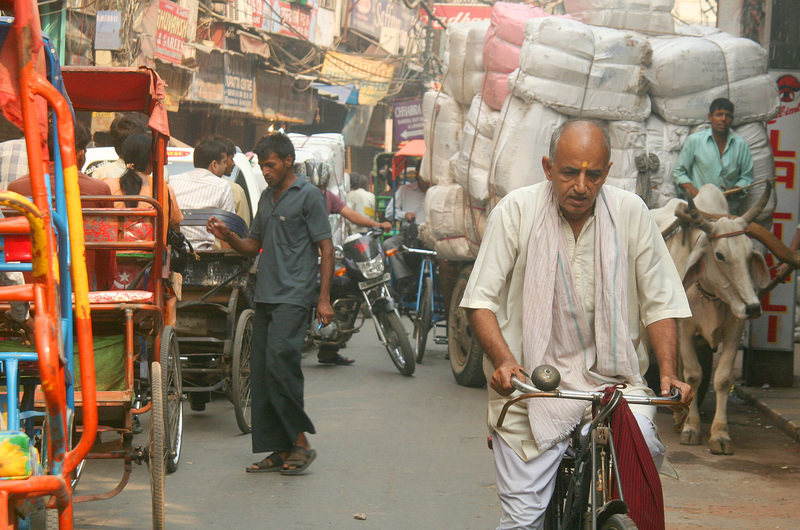 It is a wide street crazy with pedestrians, bicycles, rickshaws, cows, vendors and touts. Tiny lanes crammed with bazaars fan off the main artery like ribs. In the time of the Shah Jahan, a canal, reflecting the moon, ran down the street’s center, hence the name Chandini Chowk, “moonlit place.” I’m in photographer-heaven! I snap dozens of photos through telephoto lens; most are blurred by the bumpy ride and throngs of shoulder-to-shoulder humanity. 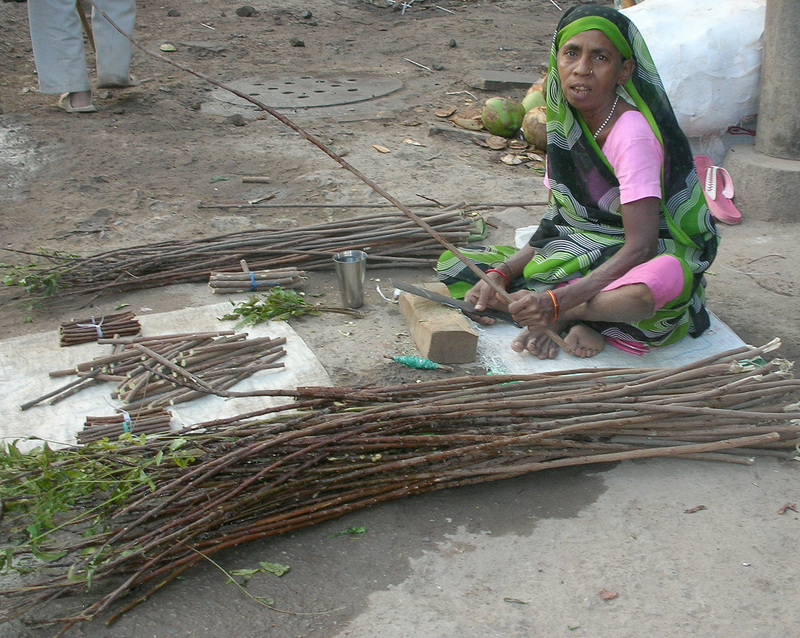 One favorite (shown here) is a vendor selling sticks cut from piles of dead branches. Locals chew on them to clean their teeth. 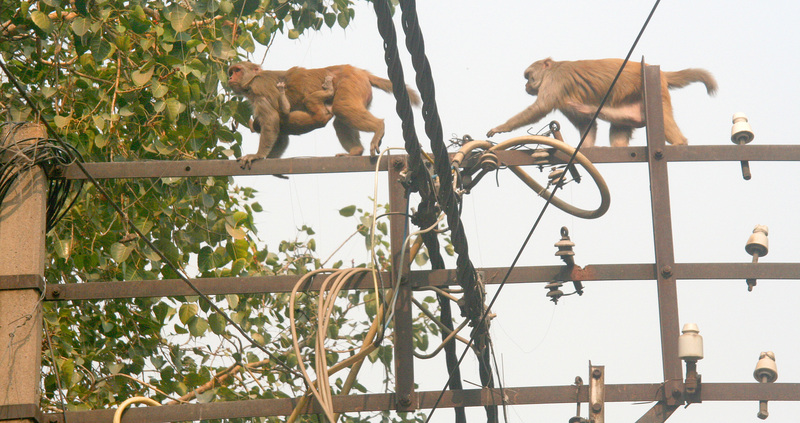 High above, a maze of electrical wires provides an evening lifeline to the shops; monkeys jump from one set of poles and girders to another. Old Deli is a crazy hubbub that bombards the senses, quite a different world from the rest of the city. The vast contrast between rich and poor becomes apparent as our driver takes us through Connaught Place, New Delhi’s core, past gated and lushly landscaped embassies from every country, to the government areas around Raj path (Kingsway) to the south. I am amazed at the size and opulence of this approach to New Delhi. Raj-appointed English architect Edwin Lutyens planned and constructed this area between 1914 and 1931, when the British moved their capital here from Calcutta. This site was to spell out the might of the British Empire, but a mere 16 years later, the Brits were out and the Indians took over. After being checked through the gate, we drive by the President’s House, built in 1929. The equivalent to the U.S. White House in function, it surpasses it in scale, with 340 rooms. At the time of Mountbatten, India’s last viceroy, the Rashtrapati Bhavan employed a staggering number of servants, including 418 gardeners! 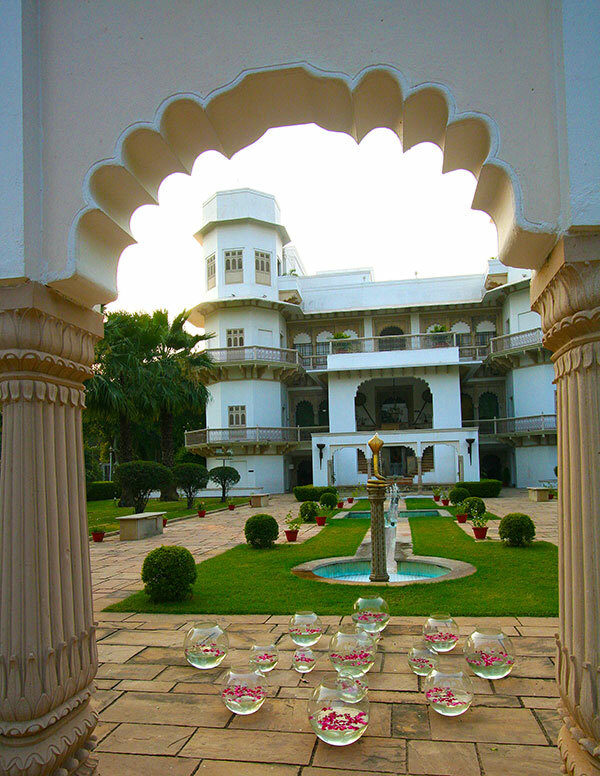 The Mughal gardens nearby occupy 130 hectares. The matching north and south Secretariat buildings that house the government ministries have 1000 rooms between them. As we leave, we drive through the massive India Gate, a 42-meter stone arch, inspired by the Arc de Triomphe in Paris, that pays tribute to the 90,000 Indians that died during WW1. 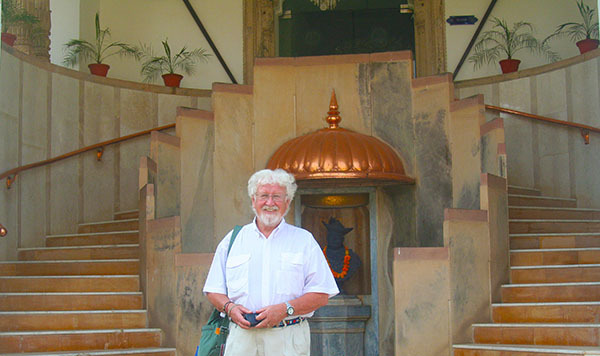 As we leave Delhi the next day for our flight to Varanasi, I realize that nothing could have prepared me for India. Already, this subcontinent has inspired, thrilled, and frustrated me. I look forward to the mind-bending experiences to come. India is only 1/3 the size of mainland U.S.
India has over three times the population of the U.S.
No wonder this subcontinent, although it appears to be so vast on the globe, seems so crowded! With more than 50% its population below the age of 25 and about 65% below 35, the average age of an Indian after 10 years is likely to be 29 years, whereas the average age of a Chinese will be 37. According to estimated figures, the population of India will be largest in the world in the year 2030. What does this all mean? I hope to find out. Indian tourists want their photos taken with us. You have searched the archives for plan an itinerary. If you are unable to find anything in these search results, you can try one of these links.